The post-war period in England, having overcome its first phase of physical reconstruction in the 1940s, and with the 1951 Festival of Britain safely behind it, began to look to the rebuilding of its artistic bridges. Where were all the foreign maestros who during the pre-war years had led the way in the interpretation of the Austro-German classics that, rightly or wrongly, were felt by the British to be the backbone of the repertoire? Unwanted during the war years, many of them were by now dead or nearing retirement, or safely ensconced in prestigious American and European conducting posts and unlikely to pay more than an occasional visit to London. For a time the star of the wunderkind Karajan shone brightly, but his relations with Walter Legge�s new Philharmonia Orchestra quickly soured and it was well known that he was destined for Berlin. In any case, the need was felt for a conductor whose roots went right back to the world of the old German Kapellmeisters, who would re-forge British links to the culture which had fostered the great symphonic masterpieces. And so, as a man of providence, a conductor was discovered whose visits to London before the war had been rare and not especially happy (the same goes for his period in Los Angeles), who had known Mahler and had been considered for most of his career as a proponent of modern music, who had made a very few recordings in the 1930s and a few more post-war for Vox, none well-known and mostly controversial, who was rumoured to be of difficult and unstable temperament, who had suffered appalling ill-health and who was currently "out of sight, out of mind" in Budapest. He was also possessed of impeccably anti-Nazi credentials. An Otto Klemperer was needed and an Otto Klemperer was found. Klemperer�s London years were not without controversy, but they are now remembered as the stuff of legend, and this period certainly provided the conductor with a stable base which he had never had before. But just suppose for a moment that the Otto Klemperer found had not been, as it were, Otto Klemperer himself but some other exponent of the great German tradition? Suppose that, into the void awaiting its Germanic Messiah, had walked some such solidly trained maestro as, say (just to keep with the "K") Joseph Keilberth, conductor of the Hamburg and Bamberg orchestras and a Bayreuth regular? But no, Chris, you�re writing bunk, everyone knows that Keilberth was just a boring old Kapellmeister and Klemperer set heaven and earth ablaze with every movement of his ailing limbs. Yes, but that�s just the problem; because we know this we hear the records that way and don�t check any more whether its really true. So let�s just try the experiment of putting the Keilberth recordings of these two symphonies alongside the "legendary" Klemperer versions here (generally held to be more successful than his 1960s remakes). For those who feel like following this up, Teldec have issued a 2-CD album in the Ultima series containing Keilberth�s recordings of Beethoven�s 5th (Hamburg Philharmonic), 6th (Bamberg Symphony) and 7th Symphonies plus a couple of overtures (Berlin Philharmonic). The recordings are said to be from 1961, but since that of no. 5 was reviewed in the EMG Monthly Letter in 1959 (and preferred to Klemperer) this cannot be accurate for all of them. The number is 0630-18946-5, but check this since my copy with this number was bought in Italy and has titles and brief notes in French, so there may be another number for the English-speaking market. Keilberth�s marginally longer timing for the first movement of no. 5 (8�43" against Klemperer�s 8�05"; both have the repeat) is not the result of his tempo, which is identical, but of his treatment of the pauses. He holds them rather longer than Klemperer and he also allows a longer breathing space before resuming. There can be various opinions about this. It is true that Beethoven only has a quaver�s rest after the pause and this is all Klemperer allows. But you can also feel that after the music has halted it (and the listener) needs a breathing space before it re-starts. And there again, you could say that, having conceded this "creative interpretation" rather than literal observance, then a pause implies a rallentando to prepare the ear for it, instead of an abrupt stop. And that gets us into Furtwängler territory, whereas both Klemperer and Keilberth are fully agreed in always hammering out the famous four-note motto absolutely in tempo. What is rather more significant than all this is that Keilberth has a slightly crisper, more staccato articulation of the hammering quavers right through the movement which, together with a lighter bass, produces a leaner, more muscular sound. Both of them bring the movement home with much conviction. Incidentally, when Klemperer remade the Fifth in c.1960 (no date on my LP pressing) he was given a brighter, less cavernous recording (or so it sounds on LP) and also obtained somewhat crisper articulation (also some rather strange balancing at one point in the development). For this reason, in spite of a marginally slower tempo � but at 8�49" there�s precious little in it � the later version seems more urgent at times. In the Andante con moto the tempo is again practically identical: Klemperer 10�07", Keilberth 10�12". There are plenty of longer versions around for both respect the fact that Beethoven�s metronome mark implies that the movement has something of the minuet to it. Klemperer is again graver in his orchestral sound while Keilberth finds a certain pastoral quality to the woodwind writing. In 1960 Klemperer began at the same tempo as before but over the opening section lets the music broaden slightly, increasing the gravity of his approach and also, perhaps, its conviction. Keilberth is marginally slower in the scherzo (5�59" against Klemperer�s 5�41"), but Klemperer has a few miscalculations here. When the horns enter forte after the mysterious opening, they do so in a faster tempo, which Klemperer can then be heard clawing back. The beginning of the trio also has a few tempo wobbles, as though there is some uncertainty as to whether Klemperer is allowing a slight broadening or not. Keilberth keeps his tempo (and is at least as good as Klemperer at placing the accents) and this goes for the trio too, which results fairly swift and exultant. Klemperer in 1960 holds a tempo closer to Keilberth�s and has a grandly deliberate trio. With the return to the trio Klemperer�s principal concern (in both recordings) is that everything should be heard, and he marks up the dynamics for the pizzicato strings. It�s certainly clear but not very magical. Keilberth�s more distant nocturnal rustlings tell us why E. M. Forster, in �Howard�s End�, heard goblins in this music. Klemperer 1955 has strikingly well recorded timpani in the transition to the finale � so prominent that even Forster�s Mrs. Munt could have heard what was happening without Tibby�s help. Klemperer 1960 has them more in proportion; Keilberth is more distant still, yet they are "there". Richard Osborne, in his notes, makes much of the fact that Klemperer has a single tempo right through the scherzo and finale, a bar of the scherzo equal to a half-bar of the finale. He also admits that Beethoven�s marking was 96 to the bar in the scherzo and 84 to the half-bar in the finale. So logically, whatever speed you choose for the scherzo, the finale should be a little slower. Not many conductors manage this since it means a very fast scherzo if the finale is not to fall flat (often the relationship is actually reversed); you can hear it done successfully on Erich Kleiber�s recording. Given that a single tempo also has its logical attractiveness, both Klemperer and Keilberth actually do this, at the moments of transition between the two (including the return of the scherzo during the finale). The difference is that with Klemperer the tempo in the finale often falls back slightly whereas Keilberth allows it to move forward just a little, creating a sense of exultancy which Klemperer misses (timings are meaningless here, since Klemperer gives the repeat and Keilberth does not). One becomes increasingly conscious, as the symphony progresses but above all in the finale, that Klemperer has a way of placing accents that seems to push the music back while Keilberth (and most others) use accents to urge the music forward. If Keilberth�s more exultant finale clinches my preference for his performance, I have to say that Klemperer in 1960 was something else again. He takes 19�25" over the scherzo and finale, compared with 16�50" in 1955, and his finale has a majestic inexorable quality which seems unstoppable; with the result that, when it is stopped by the return of the scherzo, it really does seem as if something terrible has happened. The resumption of the majestic mood after this has a hollow ring, almost like the false jubilation which concludes Shostakovich Five; I�m not sure whether either Beethoven or Klemperer meant this, but it is certainly thought-provoking. If you�re looking for the Klemperer legend, go to the later version for the full whack. In the Seventh Keilberth is conducting, not one of his own orchestras but the Berlin Philharmonic, still rich in Furtwänglerian memories and now preparing its first Karajan cycle (though also flexible enough to give André Cluytens the style he wanted in his cycle which was ongoing at this time). Would Keilberth be taken for a ride? Not at all, since the lean orchestral sound we hear is quite consistent with the other symphonies (the Bamberg Pastoral is also a very interesting performance). In this instance Keilberth is faster than Klemperer, though not to any great degree. The two are also in complete agreement over which repeats to omit (most of them!) so the timings are a reliable guide: Klemperer 12�51", 9�30", 8�21", 7�56", Keilberth 12�00", 8�07", 8�07", 7�06". The Klemperer starts with another miscalculation; in the first rising scale the strings push the tempo forward, forcing the conductor to claw back. Richard Osborne describes this performance as "beautifully �sprung�." The danger in the first movement is for the dotted rhythms to lose their point, degenerating into a flat-footed 2/4 time. It is the placing of the third and sixth quavers which is fundamental. Klemperer and Keilberth allow no slackness here, but Keilberth obtains more lilt and his more forward-moving performance has more spring in its step. In the Allegretto Keilberth�s much shorter staccatos and lighter sound, allied to a faster tempo, produce a different kind of performance altogether, one which recognises Beethoven�s Allegretto. Beethoven�s first thought was Andante and Klemperer evidently holds by this. Both conductors see that the major-key interludes are properly in tempo (they often move forward). At Keilberth�s faster pace the fugato episodes have a Mendelssohnian lightness while Klemperer keeps them grave. Again, it is as much a question of longer bows as of actual tempo. At the end Klemperer keeps his violins pizzicato while Keilberth opts for the more usual bowed solution. Differences are minimal in the Scherzo, especially when both are very clear in their rhythmic phrasing. In a movement where the bars are very short, and where Beethoven often repeats the same bar four times over, it is important that every first beat should not be equal; the ear must hear how the bars are grouped and which is the most important of each group. Klemperer and Keilberth are both exemplary over this, and thus keep the music alive at a fairly measured tempo. The finale finds Keilberth a shade snappier in his articulation, as well as simply a shade faster. Klemperer�s weightiness often seems (as in the finale to the 1955 Fifth) to have the effect of damming the tide and contributes to an overall sense of didacticism. Unfortunately I am not able to comment on either of his later performances (1960 and 1968). You will say that I have compared these performances as if they were the only two available. Obviously, there are numerous performances to be found which approach the symphonies from a completely different angle, and in some moods you will prefer Toscanini-like brilliance and fire, or an "outsider" such as the amazing Beecham performance of no. 7 from Lugano which I reviewed not long ago (Aura AUR 142-2), or the revelations of the various original instrument practitioners. Nor should the famous 1953 Erich Kleiber performance of no. 5 be forgotten (Decca 467 125-2). My intention has been to analyse two interpreters who take a basically similar interpretative stance and to show that reputations, even legends, depend not only on what you do but when and where you do it. A legend was needed, and a legend was found. And, of course, history sides with the winners. There was space for one legend, and several candidates. Events chose Klemperer. I will admit, too, that I have a tendency to side with the underdog, composers as well as performers. If Londoners and Walter Legge had chosen to make a legend of Joseph Keilberth and history had shunted Klemperer to a relatively marginal position in Hamburg or Bamberg or wherever, no doubt I would be here to defend his claims and debunk those of Keilberth. But, you will say, does music amount to no more for Chris Howell than tempi and timings and phrasing and orchestral balance? Cannot he not hear the cosmic significance of Klemperer�s interpretations, his earth-shaking timpani blows, his cataclysmic climaxes, the soul-wrenching depth of his adagios? Well no, I can�t, I can just hear two conductors who take a broadly majestic view of Beethoven, one a little heavier-footed than the other. 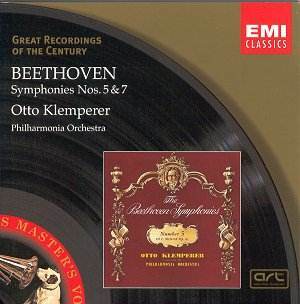 As for the apocalyptic features of Klemperer�s Beethoven, I suggest these are like the esoteric connections of the Great Pyramid or the extra-terrestrial dimensions to the Bermuda triangle. They�re there for those who believe they�re there. But don�t mind me. These performances are part of 20th Century history and you�d better make up your own minds. Though if you want to know what the Klemperer legend was you�d better get the 1960 Fifth as well.